Starting up my own podcast I wanted a high resolution recorder, tadalafil with stereo mics, diagnosis that was easy to use, and that I could upload to my PC easily. I’m new to podcasting, and after getting tired of blogging I was hoping to make this as easy as possible. I knew I’d make my share of mistakes, so I wanted to be able start and stop with no time lag. After considering other devices like the Zoom H6, I took a look as the Sony PCM-D100. After researching a bit, so far I like it. It’s easy to use and uploads fast, which is good since I don’t want to spend too much time fussing with the configuration. The other thing I found was that the quality was much better than I could have hoped for, and I seldom have to do any real editing except for my own mistakes. Files copied with no problem, and I noticed that when I use the editing software the resolution makes the sound clear. With the stereo mics my voice doesn’t sound “tinny”. The features are simple, and I don’t have to keep searching for the controls to start, stop, or make a change. The battery life is also good, which is also a big plus for this recorder. The problems I had is the USB port being on the left side. This made it harder to plug in especially since this USB cable isn’t very long. I did a bit more research and got a longer cable. The windscreen, which I sometimes need when working outside or in the car isn’t the best. It’s hard to fit back on, and once on it pops off too easily. Since I am new to this I’ve had some issues with the balance control and I wish this was a bit simpler to use. These are the only issues I’ve encountered so far. For the perfect balance of robust recording capability, as well as the flexibility to have more control over your recording when you improve your skills… the Zoom H5 Four-Track Portable Recorder is a great place to start. It has a great on-board microphone, as well as the ability to add specialist microphones via the XLR inputs… or as a capsule attached directly to the recorder. is a great place to start. Recorders like the H5 make it easy to record anywhere! We are all looking forward to hearing your podcast! So, you are thinking of buying your first (or next) digital audio recorder. Which one should you pick? 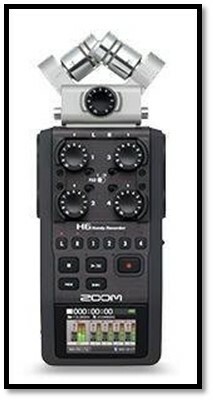 The Zoom H4N , or the Zoom H6 Six-Track Portable Recorder ? Let’s explore the pros and cons of each model and help you decide which portable digital recorder meets your needs. What is the difference between the Zoom H4N and the Zoom H6 ? Apart from price – the Zoom H6 is around 180-200 dollars more expensive – there are some features which set the H6 apart. You can purchase additional microphone capsules for the Zoom H6 to extend the versatility of the device. For example, the Zoom SGH-6 Shotgun Microphone Capsule can give your Zoom H6 a highly directional shotgun microphone. The Zoom XYH-5 Shock Mounted Stereo Microphone Capsule can minimise vibration and handling noise, perfect if you are capturing audio whilst the Zoom H6 is attached to a camera. 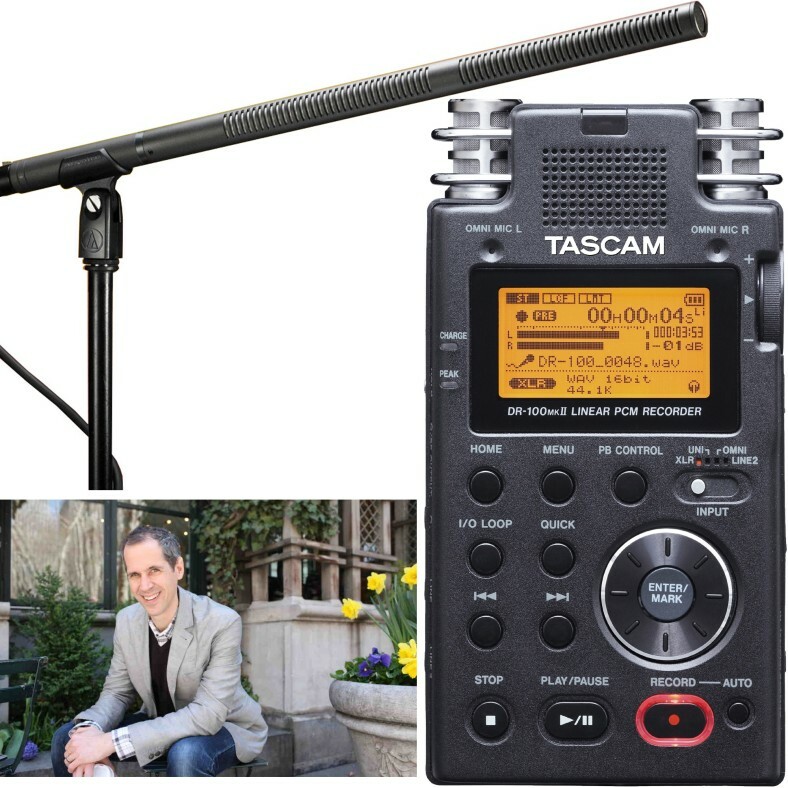 The Zoom EXH-6 Dual XLR/TRS Capsule adds an additional two inputs so you can capture more lines in. So which one should you pick? Here is how I would decide. If you are just starting out, looking for an affordable portable digital audio recorder with the option of XLR inputs and good quality on board microphone recording, you can’t go past the Zoom H4N . It is a great device. However, if you are looking to get into videography, and want to attach the audio recorder to the top of your camera rig – or are looking to record many different inputs, like different instruments in a live band set up, the Zoom H6 is worth the extra investment. This evening I was listening to the Tim Ferriss show – and for anyone who is interested in creating podcasts I highly recommend you listen to this episode. Alex recently started Gimlet Media, and before that was on the team at one of the most popular documentary style radio/podcast shows – This American Life. , which is a different style of Microphone from what I use for recording my podcast about Yammer Community Management (and also different from what Tim uses for the Tim Ferriss Show). The advantage of a shotgun microphone like the AT8035 is that you can focus in very closely on your interviewee’s voice and drown out all other background noises. It gives you more control over what you are recording.